...OF SPRING AND SUMMER...: FLOWERS by ingrid and titti - Time for Bulbs! FLOWERS by ingrid and titti - Time for Bulbs! At the farmers' market last Wednesday I found these absolutely fabulous irises called Iris 'George'. 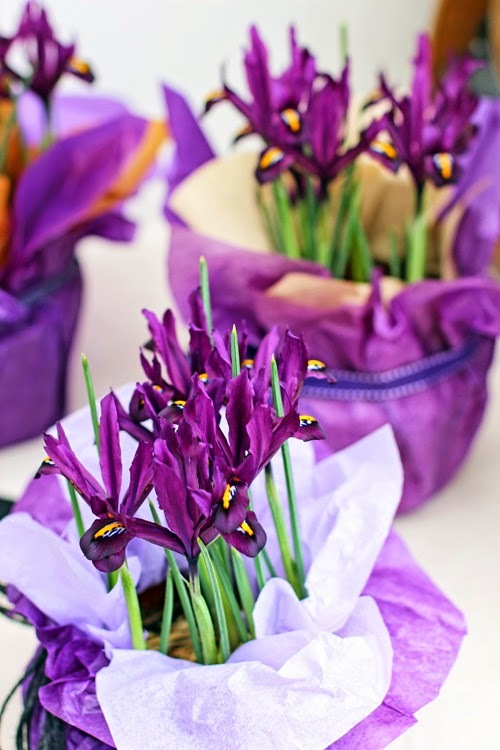 They have a dark, rich purple colour with yellow and white blotches on the petals. Most irises grow from what's called a rhizome - but this early flowering iris grows from a bulb. It flowers very early in the year and it will brighten up any winter garden with its plum-purple colour. I wanted to keep them growing in their pots - as I will later on plant them in the garden. But I needed to hide the brown plastic pot. I covered the bottom of the plastic pot with a plastic bag. I then wrapped the whole pot with two layers of paper. I did three different versions. 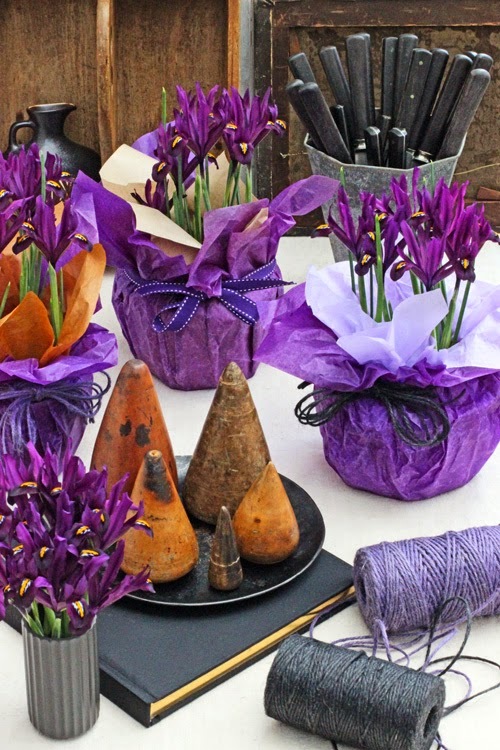 One had dark purple with lighter coloured purple tissue paper, one had dark purple with brown tissue paper and the third had dark purple tissue combined with plain brown wrapping paper. 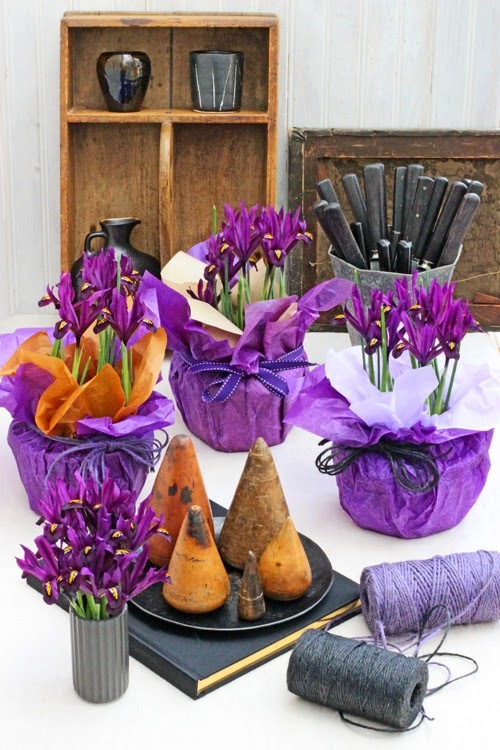 I tied some purple twine around one, black twine around another and a purple ribbon around the last one. 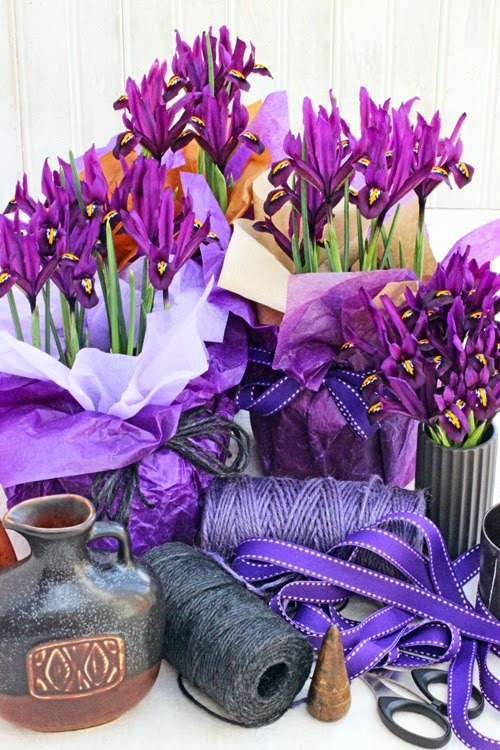 The purple ribbon is from Jane Means collection. 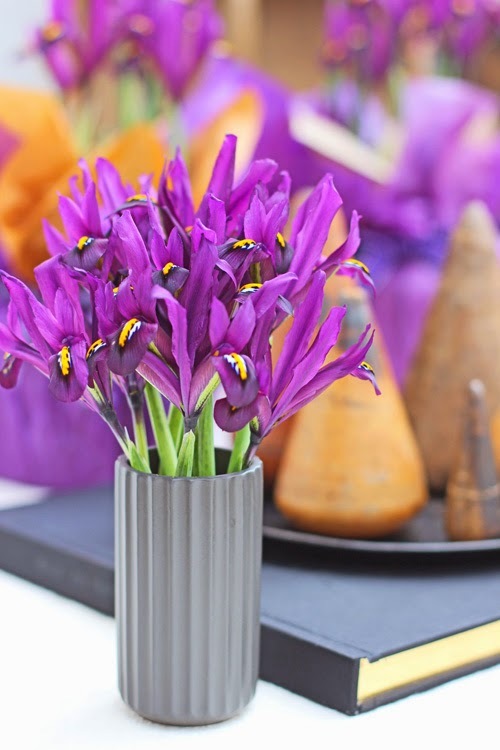 I also wanted to try using the Iris as a cut flower in a vase. 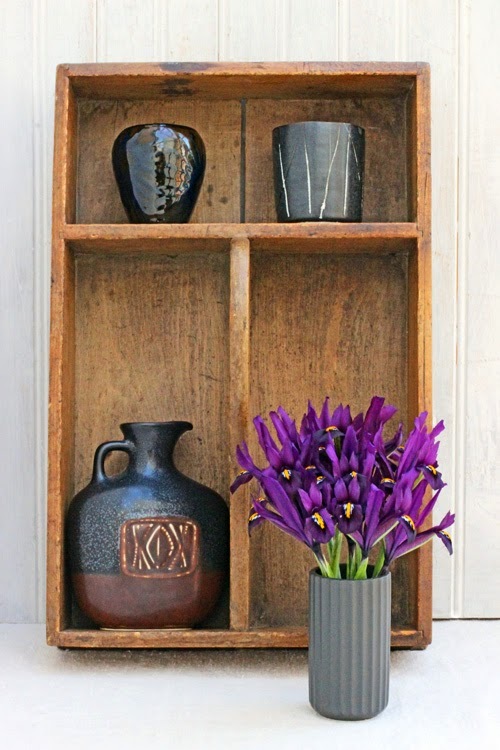 So here I have used a little black straight-sided vase that holds the flowers upright in a tight bunch. I have kept the colour scheme mostly in the rich purple tones with a few additions of brown and black. Now is the time to catch these early Irises - they don't last very long - but while they are here - make the most of it! Titti Malmberg - my Swedish based collaborator - who I work alongside on FLOWERS - has also created a blog post over on her blog HWIT BLOGG - so please follow the link and go over and see what she has done. You can see all our FLOWERS posts Here. We also have a special board over on Pinterest with images from FLOWERS. Have a Very Happy Floral Day! Ingrid, these tiny iris as so lovely...but I must tell you that the pink primulas in the prior post have stolen my heart. Yearning for spring. The sun was out today, but the temperature remained far below freezing. How pretty! Thank you for the explanation regarding these little irises. I have seen them here in mid-winter and wondered - they seem to be something like a cross between a crocus and an iris. These are so wonderful, especially with so many together. När jag kom in till din blogg idag och möttes av detta färgglada, blev jag också glad! Underbart vackert! The iris is a beautiful flower! Som vanligt ett inspirerande inlägg Ingrid!